Join us as we welcome Keerstin back for her second show on Success Freaks and her debut as co-host alongside Mordant. In today’s episode you get to meet Keerstin (again), our brand spanking new co-host of Success Freaks! Listen along as she tells about a recent “swimming” excursion she went on and fills us in on what she has been up to prior to joining the team. Mordant & Keerstin dig deep into their first listener question together as well as give some advice on being happy, getting out of a rut and much more. 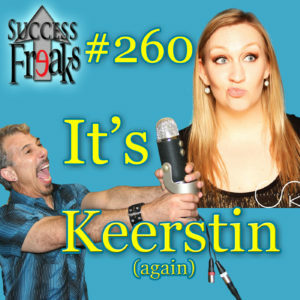 Open your ears and your hearts, as we “welcome, welcome, welcome” Keerstin to the show!